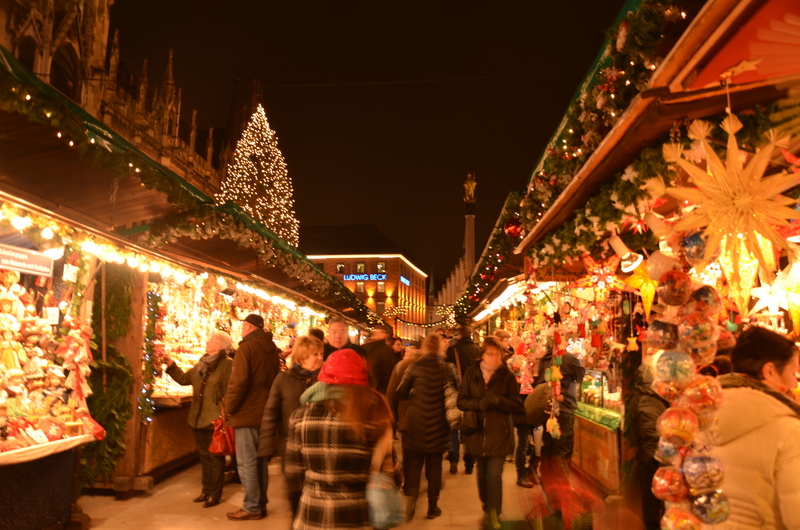 Touring the Christmas Markets Vienna, Salzburg & Munich – Why Waste Annual Leave? In the pre-Christmas period each year, there are 2 types of creature that emerge from the woodwork. There are the bah-humbug, moaning sorts that habitually whine at the first radio play of Wham’s Last Christmas, cursing its 6 week premature arrival in the world, lingering like an unwelcome odour. And then there are those that rejoice. Praise hallelujah that the season of festivities is upon us. Salute with advent anticipation the food, fun and frolics that the upcoming weeks will bring. I am a rejoicer. I would willingly put on my Santa hat as soon as the last of the pollens have floated into the smoggy London skyline; so when a few days of annual leave came up in December, 4 calling birds were calling me to Europe to sample how Austria and Germany do Christmas. And boy do they do it well. 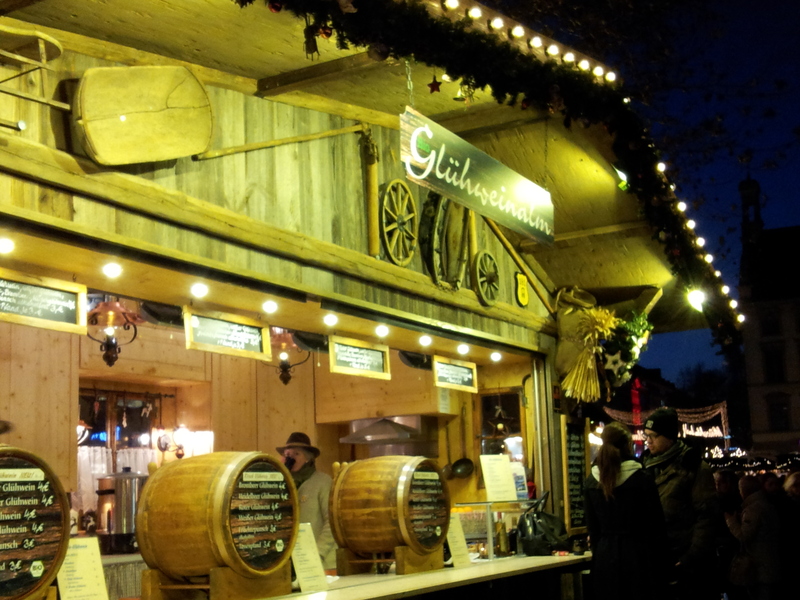 You could spend a whole season touring the European Christmas markets. 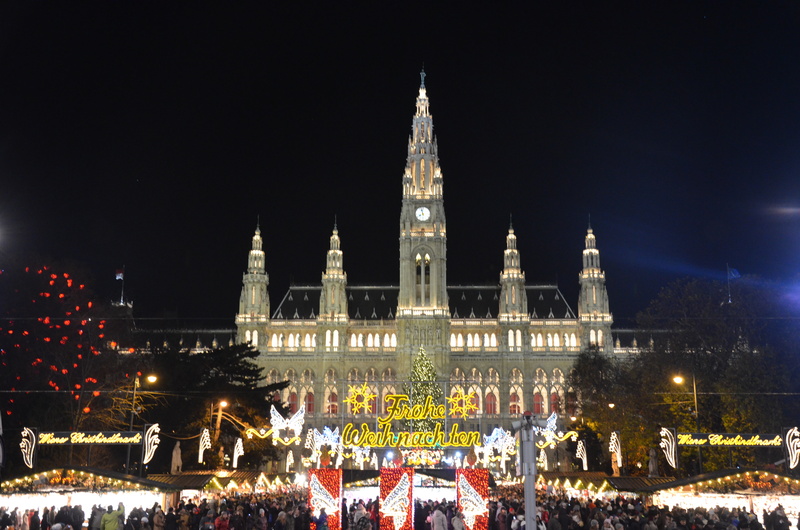 In our 3 days in Vienna, we intended to see two – (1) the Magic of Advent at the Rathausplatz, Vienna’s largest Christmas market, on the backdrop of the beautiful city hall and (2) the smaller market in front of the Schloss Schonbrunn (the Schonbrunn Palace). We actually ended up going to at least three others inadvertently – the markets are everywhere. In fact, if you don’t like Christmas, don’t go to Vienna in the winter – it’s too magical and it’ll be wasted on you. One of my favourite things about travel is that spine-tingling sense of awe you get when you see a sight that takes your breath away for the first time no matter how many photos you’ve already seen or how much reading you’ve done, showing us that no matter how much we try to second guess ourselves, our inate reactions are more malleable with an ever expanding ability to stretch (rather like my stomach when it comes to dessert). 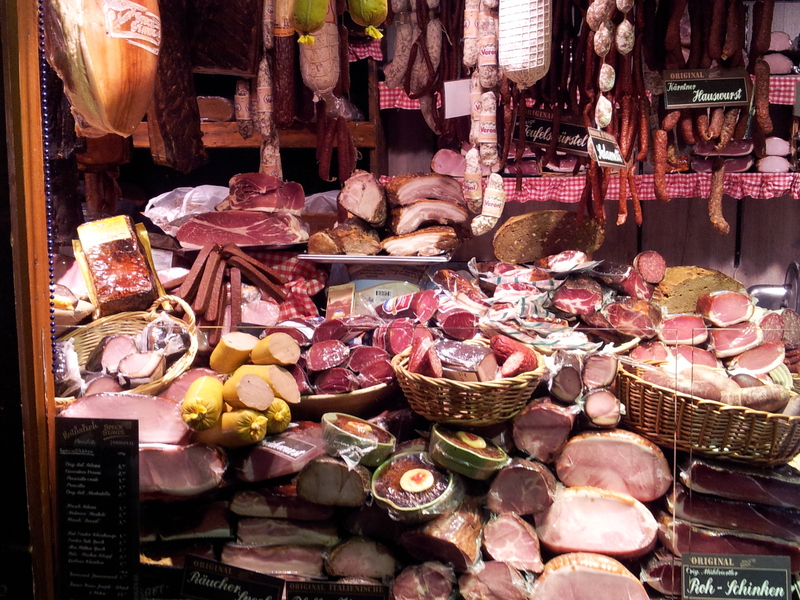 It was this sense of awe I felt when I took my first step into my first European Christmas Market, here in Vienna. 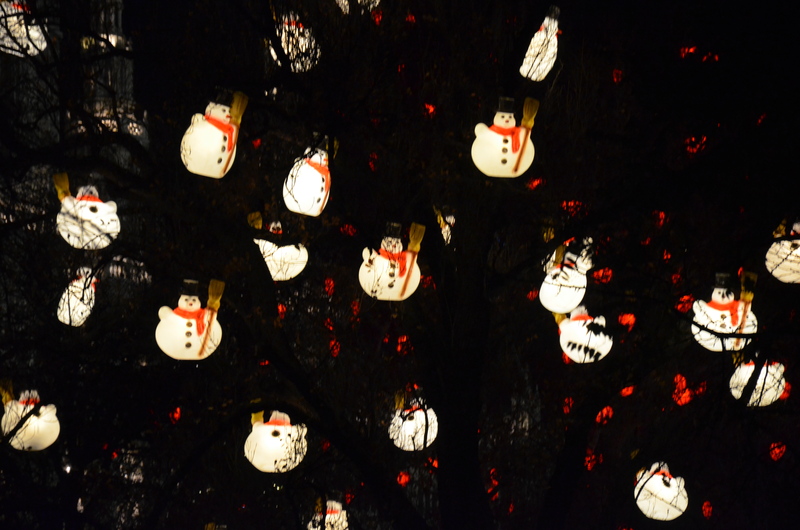 When we first arrived at The Magic of Advent Market, the lit up snowmen nestling in the trees at the entrance immediately caught my eye, whilst they kept their own beady eyes on the lit up violins in the neighbouring tree. The lights are so dazzling and yet seem classy and within limits. With over 140 stalls, we meandered through a myriad of treats and gifts. Make a shopping list – I wish I had brought mine with me – you need some structure in a place like this if you’re actually going to get anything done. With countless stalls of traditional, hand-crafted items, this is an ideal place to buy gifts for those already-have-everything people. 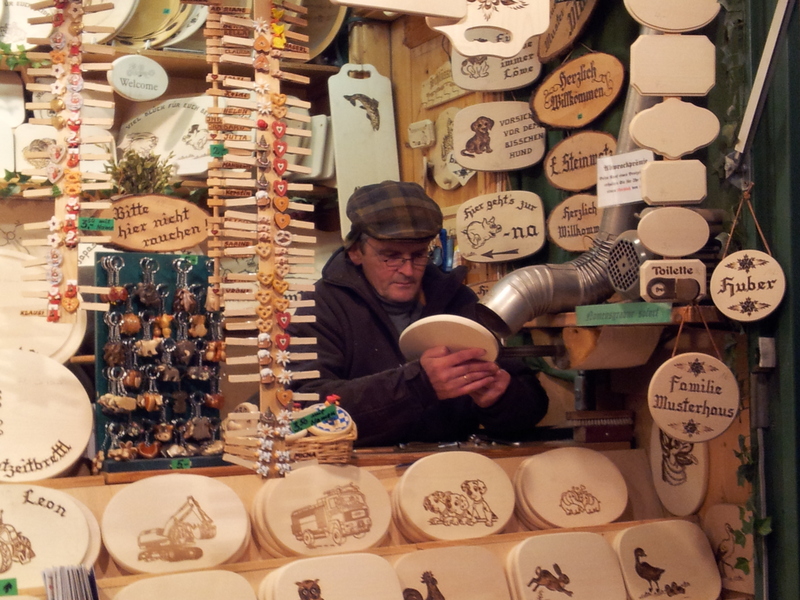 For me, the canary-yellow, bees wax candle stalls stood out and I developed a bizarre fascination with chopping boards after finding a fabulous, rustic stall in Munich allowing bespoke engraving on an array of handmade wooden boards. 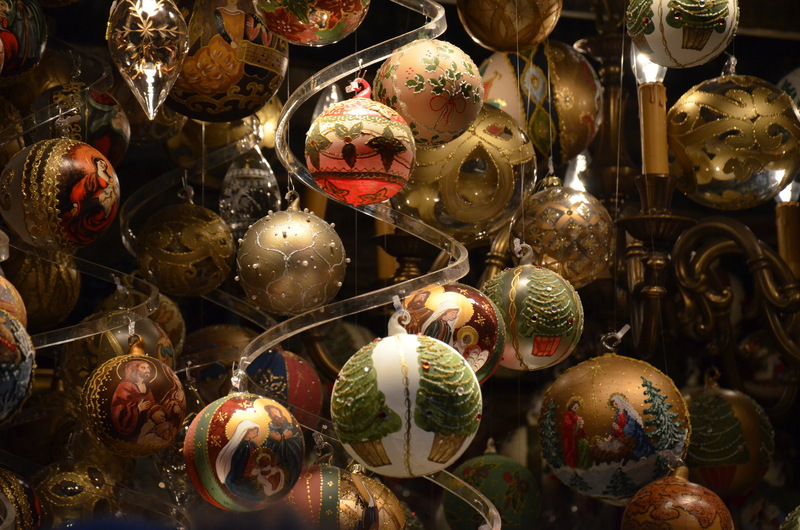 And if you need goodies to adorn your tree, you’ll find glittering, spherical handmade baubles, large and small, glass and wood, matt and sheen. There is something for even the fussiest tree-dresser. 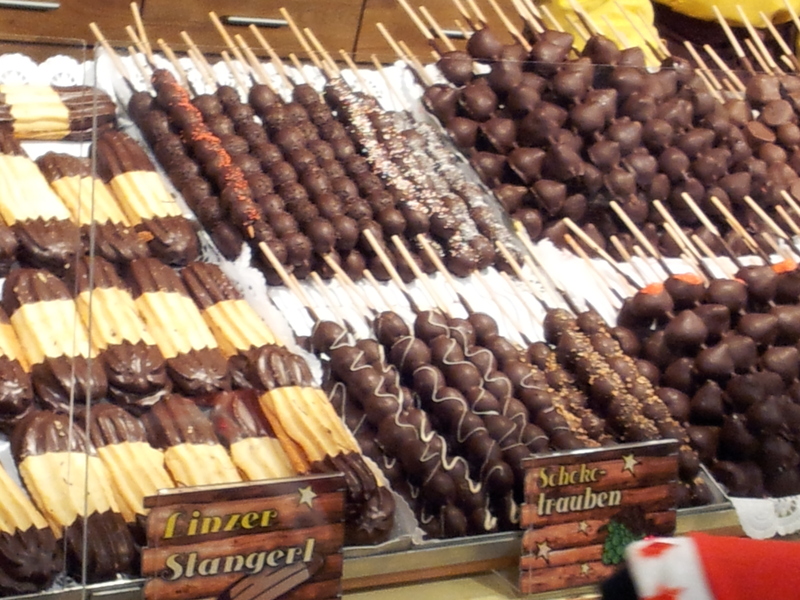 The real treat for me though (predictably) was the abundance of food stalls at the market. This is no place for small appetites. Leave those at home. Highlights included huge pretzels – if you’ve spent a lifetime looking for a rum-flavoured Pretzel, apparently this is where to find one. They were, I’m sure, larger than my face and I’m not even sure I could hold one let alone eat one. We also saw a vast selection of wurst (I gave up counting the types), and some comforting chestnut soup served inside a huge bread-roll bowl. Save enough space for more than 1 dessert as the choice is mind-boggling. There seems to be a huge craze here for chocolate covered fruit, chocolate covered marshmallows, chocolate covered toffee apples, biscuits. I think they would happily cover anything in chocolate. I, for once, battled my cocoa addiction in the quest for more local specialties. I loved the Kaiserschmarrn and the sweet potato dumplings with apple compote. (A place like Vienna deserves a dessert-related post in its own right so stay tuned for more on that). I regretted not trying the traditional Bratapfel – roasted apple with chestnut and wonder if there is ANYWHERE I could go in London to try and retrace my steps on this one! When I needed a throat warmer for those shivers, I opted for a hot chocolate doused in Bailleys or Amaretto. Drinks are generally assumed to have alcohol. 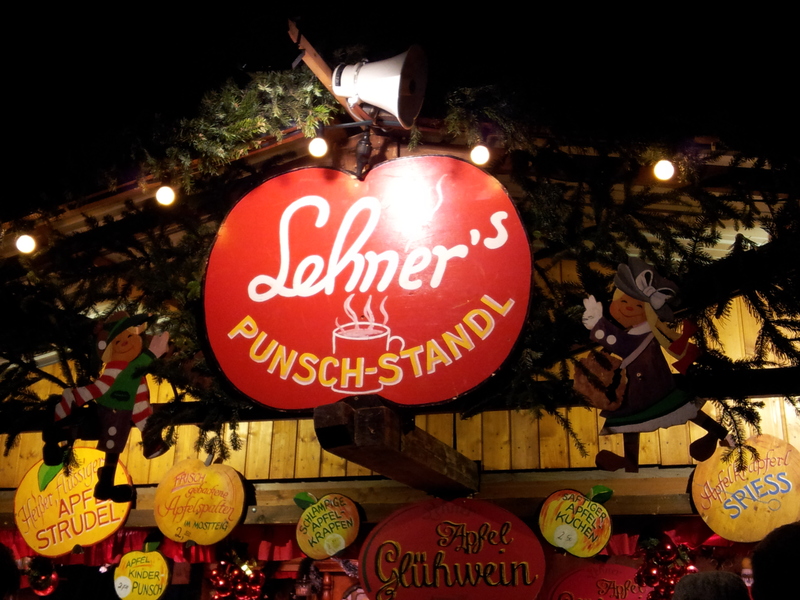 If, like me, you are teetotal (I figure when Baileys and Amaretto are mixed with chocolate, they don’t count), then you’ll need to opt for the Kinderpunsch – “for drivers and children” they state – a very sweet, spiced apple drink but nothing on real Gluhwein (mulled wine) Pumpkin reliably informs me. It is the Gluhwein that’s being swigged by the masses everywhere you look in cute, souvenir mugs (in Munich, they’re shaped like Santa’s boots) which you can either return when you’re done to claim back your deposit or you can keep if, like us, you want to recreate the Gluhwein experience in the comfort of your own home! I am a self-confessed Lebkuchen-lover – there’s something about their gingerbreadiness that strikes the perfect balance between cake and biscuit and we were spoiled for choice here. Wait till the end of your trip to buy them. They may be delicious but they weren’t designed to withstand international travel. I’m sure they were designed to go straight from hand to stomach actually. 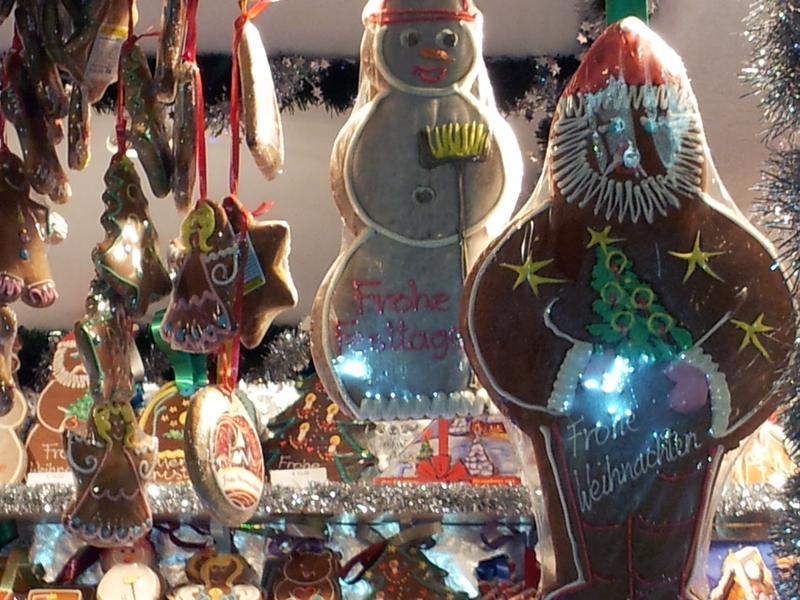 Purists state that they conventionally come either covered in chocolate or with nuts on top but in these markets, you’ll sniff out Lebkuchen in a range of festive flavours including, Baileys, mulled wine, coconut, marzipan, eggnog and a range of wintery fruits. At the Munich Christkindlmarkt, I even managed to find a healthier-alternative, fruit-sugar Stollen for my diabetic Dad to go alongside a more luxurious marzipan, pistachio and white chocolate one for my less-diabetic in-laws. It’s so easy to come somewhere as magical as this and get carried away in buying gifts for everyone else – don’t forget to get yourself some treats as well! The daily soundtrack to your market visit may include performances by choirs, orchestras and big bands. 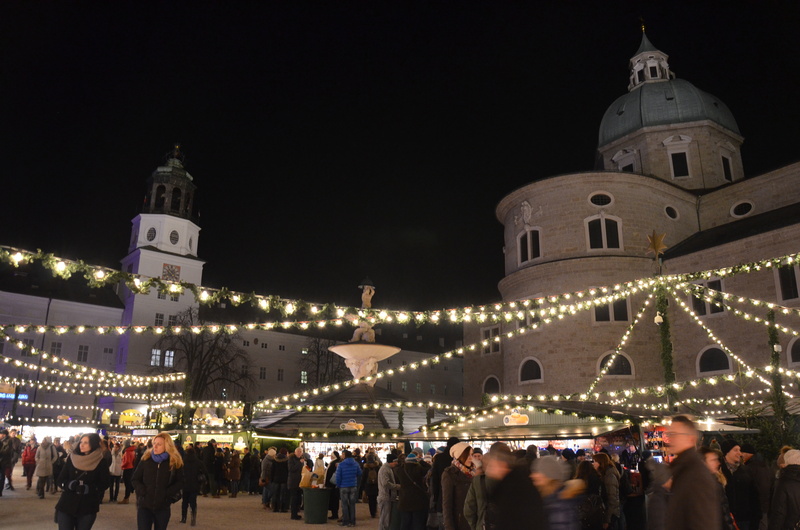 In Munich, we arched our necks upwards to hear the descent of carols from the balcony of the old town hall. There is something about the backdrop, the aromas, colours and merry feeling that makes this a perfect place to watch a musical performance. Just grab a hot tipple to keep warm and join in the singing – it was the one and only time I managed to put to use the lesser known Latin rendition of O Come All Ye Faithful, a song that my high school, for reasons still unclear to me, insisted we learned. If there is a Christmas-Scrooge in your life (until this holiday, there was a Pumpkin-shaped one in mine), drag them to a European Christkindlmarkt and you might just witness the Ghost of Christmas present coming through (and if you’re very lucky, he might even buy you some presents!). The wafting smell of freshly roasted chestnuts beckoning you, the glittering Christmas trees on every street and the perfectly synchronised melodies of the choirs bringing smiles to crowds of wide-eyed tourists will win over even the most cynical. Merry Christmas! 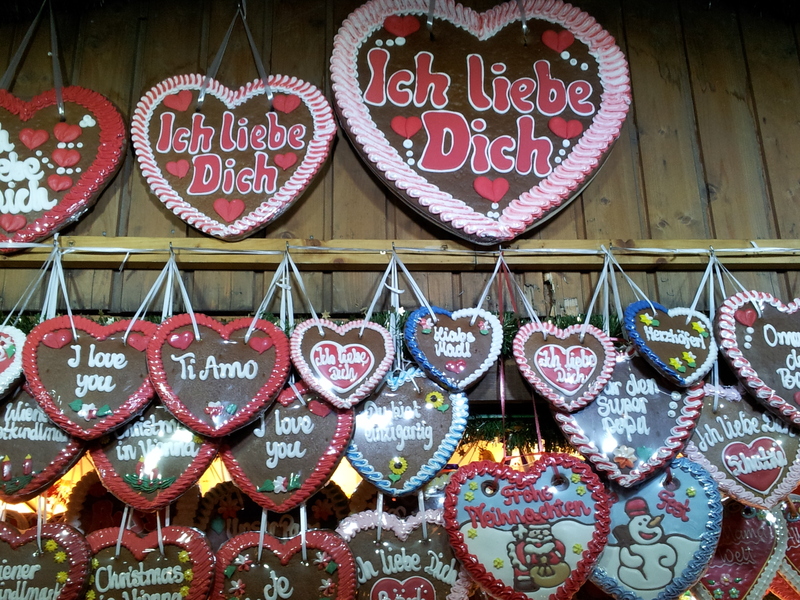 So cute, love Christmas markets! Thank you! I do too but had only really been to the ones in London before this trip and didn’t realise just what a big phenomenon they are on the continent – I’d love to visit the one in Bruges or Prague next! Pingback: Bavaria, Germany – An Alternative Winter Honeymoon? | Why Waste Annual Leave? Pingback: Scenic Salzburg – From Mozart to Maria | Why Waste Annual Leave? Pingback: An Old Fairytale Ferris Wheel at Prater Park, Vienna | Why Waste Annual Leave? Pingback: Singapore’s Christmas Trees, Festive Lights and Dazzling Decorations | Why Waste Annual Leave? 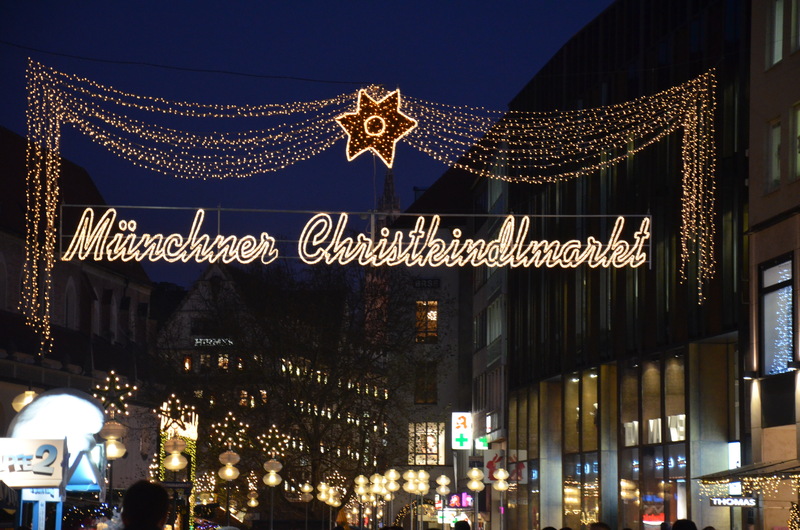 Confused for planning my Europe trip in Dec to see Christmas markets. I have decided for Vienna Salzburg innsburg and Munich. Do you recommend any changes to this Itinerary? I just discovered your blog and first thing that got me interested is your Vienna post, as I’m going back to Vienna this December and can’t wait to hit those Christkindlmarkts! 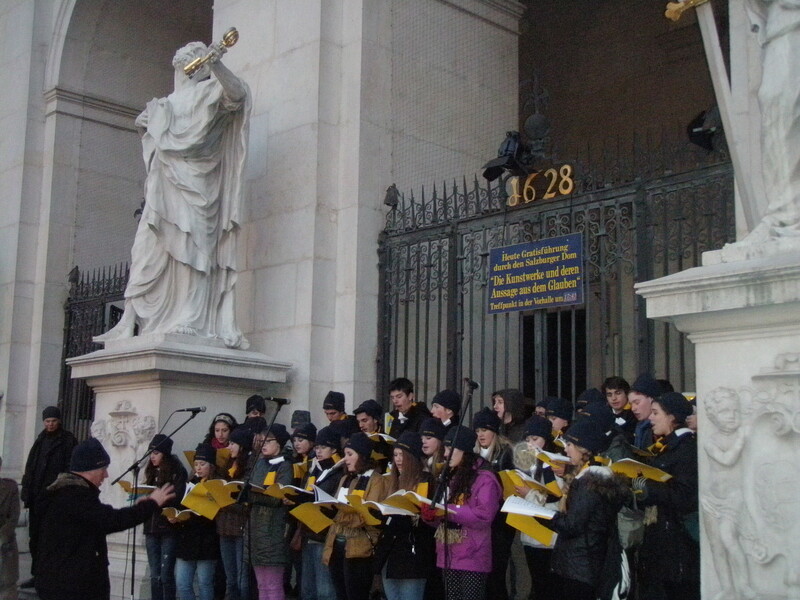 Your post just brought back lovley memories of Advent trips to Vienna and got me excited to visting again.